We’ve been taught over the years that the American Dream is owning a home. Not only that, but your home is your greatest asset and can be used to build wealth. Well, that way of thinking has made a lot of people poor. Real estate has made plenty of people wealthy, but it makes even more people poor. Can you make money buying and selling your home? Absolutely. Can you lose money? As we’ve seen in recent years, that’s an even more likely possibility. The problem isn’t that real estate can increase or decrease in value over time that makes it a poor investment, but it’s the dangerous combination of people using so much leverage and not factoring in other real world factors that even if the value of their home increases they can still stand to lose money. A lot of money. Say you purchase a home for $200,000 and sell it ten years later for $300,000. You just made $100,000 or realized a 50% return. That’s a nice profit, right? Not so fast. While this is what most people dream about when purchasing a home it isn’t that simple. Unless you paid for the entire home with cash, somehow had no property taxes, no homeowners insurance, and no maintenance expenses, you did not earn 50% on your property. Let’s run through a typical example to show where the money is really going. First, when most people purchase a house they have to borrow money. To keep things simple we’ll work with the old standby rule of putting 20% down and financing 80% so we can avoid PMI. Taking that same $200,000 house as mentioned above we’re now going to drop $40,000 down as a down payment and finance $160,000 at an average rate today of about 5.25%. So, let’s look at the typical breakdown of 10 years of payments on a 30-year fixed mortgage in terms of just principal and interest. These numbers are rounded and are just using some quick averages for simplicity sake, but you can get a general idea of what those 10 years of payments on that $160,000 mortgage look like. Over that time you will have a total outlay of over $100,000, with just under $30,000 going toward the principal and over $75,000 being lost to interest. Just looking at the numbers we can already see that the $100,000 gain in property value is clearly not going to translate into a $100,000 return on your investment. Here you can see where that money has actually gone. All said and done, when you factor in the down payment plus 10 years worth of mortgage payments, you’ve invested over $146,000 into your home. 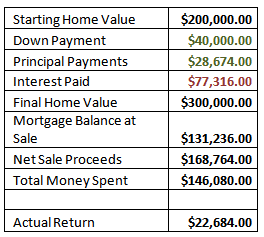 When you subtract the outstanding mortgage balance with the sale proceeds you’re left with just a $22,684 return. That comes out to only a 15.5% cumulative return over 10 years, or just a percent or two average annual return on your total investment. And you thought savings account and CD rates were bad… Here you just had your home increase in value by 50% in ten years that only nets you a 15.5% real return. The above example was just a very basic example using the mortgage payment vs. purchase and sale price. But that isn’t taking into account all the other real world factors when buying a home. There are a few other things that will affect your total return as well: inflation, property taxes, homeowners insurance, realtor commission, and maintenance. First, let’s look at the inflation adjusted final sale price assuming 3% annual inflation over that ten year period. With 3% inflation, you’d need to sell your home for $268,783 ten years later just to break even with inflation. Since you sold your home for $300,000 you could say that your inflation-adjusted return is merely $31,217. When you factor in your actual return of $22,684 from above you actually lost $8,533! What about property taxes? When you buy a home, you’re also assuming property taxes as well. Again, for simplicity sake we’ll say that that property taxes average out to about $3,000 annually. Over ten years that’s another $30,000 of money spent on your “investment.” What about homeowners insurance? Again, you need to protect your investment, and at say $800 annually you can figure another $8,000 or so spent over those ten years. That’s nearly $40,000 in expenses that subtract from your profit. If we look at an inflation adjusted return of -$8,533 and tack on property taxes and insurance you’re looking at a total real return of -$46,533. That isn’t a misprint. You could sell your home for $100,000 more than you paid for it ten years ago and still end up with a loss of nearly $50,000. Some investment. But What About Tax Deductions? I’m glad you asked. Mortgage interest is generally tax deductible, you’re right. But for 2009 the standard deduction for a married couple is $11,400. 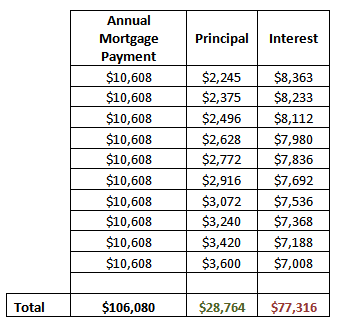 In this example the annual mortgage interest is generally between $7,000-$8,000. A married couple would just barely be on the cusp of using the mortgage interest and property tax deduction vs. standard deduction. Depending on your financial situation and other tax deductions you might still opt for using the standard deduction. Even if you were able to itemize and claim these deductions, only the deductions above and beyond $11,400 standard deduction would be considered a bonus for owning a home. Even if by using the interest and property tax deductions gave you an additional $5,000 over the standard deduction that’s only a total tax savings of $1,250 annually at the 25% tax rate. Over ten years that’s just $12,500 which is not nearly enough to offset everything else. The example I used here is just that–an example. There are clearly a number of different variables in play. Depending on how much of a down payment you use, actual rates of inflation, property values, length of time in the home and so on, there are going to be situations where you can actually make money and situations where you lose even more. This is in no way meant to say that buying a home is a bad idea, but it’s merely an exercise to help you look at the whole picture and not get caught up in the idea that even if your home increases in value that you’re going to walk away with some money. Some will argue that much of this is moot simply because even if you didn’t buy a house you’d still be paying money to rent a place, so even if you can build some equity over time and may get a tax deduction that it’s still a better long-term alternative than renting. That’s a valid argument, but this wasn’t meant to be an argument of renting vs. buying. Instead, it just tries to shed some light on the notion that even though your can seemingly sell your home for much more than your original purchase price, you really might not be making as much money as you think. Bottom line is that you home is a place to live. If you buy a home with that in mind and enjoy where you live it doesn’t matter if you make money or lose money. Above all else, your home provides shelter and enjoyment. If you can find a way to make money when you sell it, that’s great. But as long as you keep in mind that your home is not much of an investment in most cases, you can keep things in perspective and spare yourself some disappointment. the main point & difference would be long term or short term home ownership before moving. if you plan to stay though out the term(10,15, 20 or 30yrs) then it would become a matter of paying your principle down faster to reduce the payment to interest since all loans are interest-front loaded. at least make 1 extra payment to your principle a year. A home is a home regardless of what the market does. When I paid for my home I was not buying potential. I was not buying for what could have been. I was buying a comfortable and safe place of residence. I am still getting that for every dollar I spend regardless of the house value (measured externally). In fact, my house value (measured internally) has increased. We’ve grown attached to our home. It is more special to us now. The home is more of a home. When you want to invest you are more likely to move to a neighborhood that doesn’t personally suit you as well, just because it presents a great possibility for a return. When you want to invest you are more likely to borrow extra money (because you’ll get more return) and as a result you might jeopardize the peace you enjoy within the home. When you want to invest in a home you are more likely to be concerned about market drops and increases. 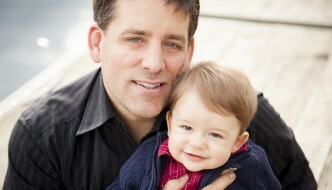 When the market is hot you might think about moving the family just to take advantage of the market. Basically, what it comes down to is, no matter what the economy is like and whether you own, rent, or rent out a home you own, you are providing great profits to the banks, insurance companies, and government. Possibly a miniscule bit of profit for yourself if you are really lucky. It makes the most financial sense to either 1. pay cash for your home and live there until you die, or 2. Live on a park bench and pay cash for everything you do. Um, I don't know if anyone has said this yet, but you have to pay rent REGARDLESS of whether you buy a house. If you live in your own house, you are paying rent to yourself---its called imputed rent (think of it like an opportunity cost of not renting to others). So when you buy a house and live in it, you pay for the house and YOU ALSO PAY RENT TO LIVE IN IT. When evaluating whether to buy a house, evaluate it only as an investment like stocks or bonds. Lets assume this same couple didn't buy the house and instead kept the 40k. Afterwards they went and rented a place to live for 10 years at approximately $1000 in rent a month. After 10 years, they would have paid 120k in rent to their landlord and walked away with 40k plus some earned interest on that 40k and nothing else. NADA. ZERO. If they bought the house, they'd have to pay a couple hundred extra a month but they're getting back close to 120k at closing plus 40k down payment. Now what do you think is better? I agree with this 100%..too bad most dont get it. A home is an investment in personalization and stability. Many of the benefits awarded to home ownership are not immediately fungible but they are still investments. From a strictly financial point of view, ownership has not been a good investment, when including opportunity costs, maintenance and depreciation. When it comes to a market comprised of owner-occupiers and investors, the price is inevitably set by the investors. The intangible benefits given to home owners are spoils for living in a productive society and not a blanket justification for paying a premium over renting. We consume housing just as any other capital asset -- buildings and landscaping depreciate and require regular upkeep including one's personal time, which is not necessarily free. Homes appreciate roughly at inflation so the asset value will typically lag other similar investments when including dividends. I would add in those costs to the cost of capital when determining how much equivalent rent really is. It's not just mortgage payments and property taxes. Investors know what all these costs amount to and for a condo you should expect a yield of around 10-12%. If gross yield on your condo is not in this range, expect to take a loss in terms of asset valuation or foregone free cash flow that would have compounded above the rate of inflation. As for the other items the fees cover, I’d have to pay trash removal, electric, and water anyway. I already pay water and elctric for my unit, but if I had house with a yard I’d be paying extra for water anyway. Good use of numbers there.. but owning a house is always better than renting one.. the satisfaction is enormous. @Miranda. Please convince your husband that owning a home is a bad investment. The sell your home to me. I'll be happy to rent it back to you. Excellent article. Since this article didn't factor in the fact that you have to live somewhere, it seems that it is likely to cause more people to conclude against homownership and then go off and rent places from those of us that look at real estate differently than the author. @Beth - $325 doesn't get you much around here (Boise ID) any more, either. That was our first rental home and then home purchase, over 21 years ago. At the time, houses were running in the $25-35K range, then when we sold in the $70-80K range, and now you can't find much for under $140K. It's all relative. Good grief, Jon! Where do you live? Where I am, $325 a month doesn't even get you a room in a shared apartment, but $69,000 might buy you a spot in a trailer park. @Erica: Actually, my payments on the first house were PITI, so I kinda did figure it in. My rent on a much smaller house had been $325, and our payment was $348. If a person can find a place to live that's cheaper than making a house payment, and invest the difference, I don't dispute that there may be better investments out there. At least I got a significant chunk of my payments back at the end of that deal, which is better than can be said for Bernie Madoff's investors, eh? @Jon: Seems to me you missed the article's point! You didn't factor in property tax or higher insurance and maintenance costs into your "profit." Factoring those in, plus inflation, makes it likely that you didn't make a dime from owning that house. I think that the recent real estate boom, promoted by the idea that a home was an investment, where people could make a huge profit very quickly, was definitely the wrong approach. However, a home can, indeed, be a good investment under a number of circumstances, if one is either very diligent or very lucky. My wife and I bought our first home for $33,000, and sold it for $69,000 about nine years later. Our payments over that time were about the same as we had been paying in rent for a much smaller place, so in a certain sense, all of the equity we took out was "profit." At the very least, we had "saved" the money we would have spent on rent, and got it back at the end of our home ownership. One could also buy a small home, live in it for several years to develop some equity, then turn it into a rental property to generate income and allow someone else's money to pay it off for you, while tapping some of the equity from its appreciation to make the down payment on your next home, starting a business, or whatever else moves you towards your goals. Repeat this every five or six years, and eventually you'd have a fleet of rental properties, which is certainly an investment. You can also play the flipping game, which my neighbor, a building contractor, does quite successfully, in which case the home purchased is definitely an investment, whether you decide to live in the home during the improvement process or not. So, yes, a home can be an investment, but it may or may not be a "good" one, in comparison to other options out there. I think if you chose a nice house, good location to all the necessary places, and live in the house - technically it is a life long investment - once you pay off the house you're sure to have a place to stay or even rent it out to someone and get a fix income from it. However, if you buy a house not to live in but to sell in the near future (depending on the house market) this may not be good and can be very risky. So in this sense (especially in this market) you shouldn't treat a home purchase as an investment since it can really hurt you. 1 - in order to NOT have to worry about real estate prices (my monthly payment is the same no matter what happens in the "market"). If I rented I'd have to worry about watching my rent go up by some ? amount every year. 2 - so my "rent" is tiny (property taxes + maintenance) when I retire. 3 - most importantly, so no one can tell me to leave. Houses have an internal rate of return of slightly less than inflation in the last 100 years. The housing market drop has brought the real inflation adjusted average value of houses back to what it was in 1952 in America. I am Canadian and I just don't understand the idea that a house is an investment. Good post! I've been looking at the condo I purchased 4 years ago as an "investment", actually more like a "BAD investment". You can see my post here: http://www.lifetuner.org/topics/15-buying/discussions/244. It doesn't bother me as much anymore because like you, many have told me not to think of it as an investment - much better just to think of it as a home and enjoy living there. Jen, thanks for all the information! It's very helpful. A condo is within my budget, but I'm just starting to play with the numbers. My issue is that I'm still single, but I'm aiming to change that situation in the next five years. With my rent going up (and my apartment literally falling apart) I wonder how much damage I'd do to my finances if I bought a condo now only to end up combining households with someone in a couple of years. Hi Beth - Good for you for considering possible changes in your situation and how that could affect your living choices! As for the condo fees, those tend to be a wash on insurance and maintenance. I own a condo with a monthly fee. The fee covers landscaping.snow plowing, trash removal, common electric and water (for watering the lawn), the condo reserve, and master insurance. The master insurance covers the comon areas and the building, including the roof. Because I have a condo with master insurance, my homeowner's covers what's inside my condo and liability. The result is I pay roughly half for homeowner's that I'd pay if I owned a single family house. So, as far as insurance expense goes, it's probably a wash - maybe I'd pay less if I had a house, maybe more. As for the other items the fees cover, I'd have to pay trash removal, electric, and water anyway. I already pay water and elctric for my unit, but if I had house with a yard I'd be paying extra for water anyway. The landscaping and snow plowing costs I may or may not pay, depending on if I did those myself. Odds are, I wouldn't. I hate yard work. I'd probably hire a lawn service. Or pay a neighborhood kid to mow the lawn. I might be willing to shovel/plow my own driveway and sidewalk, but I might also just pay the same neighborhood kid to do that. So on those expenses I'm probably paying a little more in a condo than in a house, but not much more. And the condo reserve is for large expenses such as replacing the roof and unexpected maintenance costs, such as repaving the driveway after a harsh winter. Things I'd want to save for anyway if I owned a house. The only catch here is that if I move, I can't take my share of the reserve with me. But, if I move into another condo, that association should have its own reserve, so in a way I'd be swapping one reserve for another. The trickier part about a condo is dealing with the other owners, and making sure the association's property and finances are managed well. That is the fundamental problem. you can not separate the alternative cost of rent and evaluate homeownership as a investment. Irregardless of what you do you will pay for a place to stay unless your a freeloader. I agree with you that most people have a flawed sense of investment when it comes to owning a home. A better way to illustrate that point would have been to show how overpayment for a home vs rent cant destroy equity gains. Great overview. I like seeing how the numbers work out. I find it hard to justify buying a place right now when my situation could change drastically in the next couple of years. With condos, there's those monthly fees to add in too! That's why I added that caveat at the end pointing out this isn't a buy vs. rent argument. Obviously something is better than nothing with all else being equal. I was more or less trying to illustrate the notion that what people think of their home in terms of generating a profit is likely not as big of a profit as it seems. And I used a 10 year holding period because the last data I saw the average length of homeownership is usually between about 8 and 12 years. Obviously, if you intend to stay in your home the length of the mortgage and beyond, long-term that is a huge benefit. But the average person doesn't do that, at least not the people in this generation of roughly 28-42 year olds. Which turns out to be 121608, and guess what you walk away with? Nothing. I'm not saying your home is an investment, it's a lifestyle choice. However, if rents and prices are at near similar levels (which they should be unless one got out of hand) and you plan to stay in the same area a while it probably makes more sense to buy. Do that same calculation over 20 years and your mortgage payments are still 10608 and your rent ends up at 18601. How about in 30 years? If your house is paid off your mortgage is now 0. Your rent? $24998. 10 more years? Still 0 on the mortgage, yet $33595 on the rent. Assuming this person is like most people and rely on their company pension or a small retirement fund and social security, who do you think will have a more comfortable retirement?